This week we will begin our annual paper white planting. 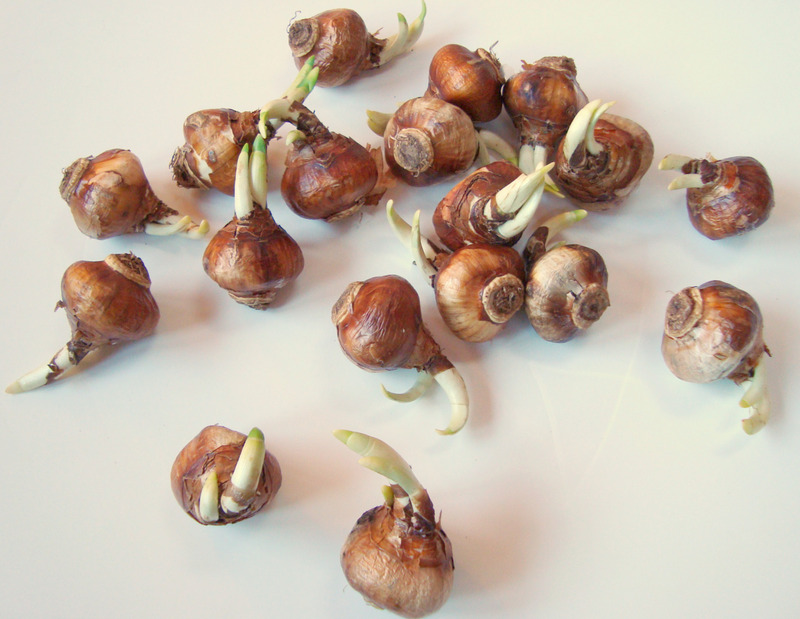 I've found that bulbs planted during the last days of November will begin flowering by mid December... right when we like to gift them to teachers and friends. By keeping them on window sills and close to our wood stove, they stay very happy soaking up the heat and light. We've been saving our tin cans for the last month or so, because our list is longer than usual. For instructions please see last year's post. If you choose to do this with your children, keep a ruler on hand. It's fun to chart each paper white's growth. We like to make guesses as to which one will be the tallest, etc. Have you noticed some subtle changes around here? I'm in the process of freshening up this space and had some wonderful help from a good friend. Thank you, K!! I'm especially excited about that brand new search bar in my new left column! Very handy, I tell you. I feel a bit silly admitting to how much I've enjoyed searching my own blog, but I spent far too much time typing in words Sunday morning. Good idea. I keep forgetting to do things like that, so thanks for the reminder. My kids wants to make gifts and yule preparations all the time, so this idea is just great. Don't have any cans though, but lots of jars. And loads of burlap scarps (since I bought your bucket pattern). Thanks!! I was just thinking about paper whites and how I cannot wait to grow them--they bring so much brightness to the depth of winter! Happy Monday my friend ! I too would love to have three columns but don't know the heck how to do that myself ! I need to start looking for bulbs...for some reason they aren't always easy to come by. I read a tip last year about adding vodka to the water when the plants are as tall as you want them to be...have you ever tried that? Leslie- I researched the vodka last year, because they can get a big tall and leggy. I turned out that the amount of vodka I would need for how many paper whites was too expensive.As I remember, they need quite a bit on a regular basis... little lovely lushes! Ooh I love paperwhites too; thanks for the reminder it's time to get them started. Wonderful for kidlets... they can practically see them grow before their eyes! I'm curious how the new search bar is different than the Blogger one at the very top of the page. That one has always worked pretty well for me, but it sounds like it's worth adding the extra? What a great gift idea, and how nice it would be for a bunch of beautiful flowers to bloom right around Christmas. I will have to try to find some bulbs. What a great idea! My kidlets will love it! I still have some cans left over from the last paperwhite project. I made them for Easter, but Christmas would be a nice time for paperwhites too. I always have to plant an amaryllis too! Paperwhites are such a lovely idea for gifts. I like the look of your site and the cardinals are so beautiful. Keep up the good work. Happy simple gifting to you....I can't wait to try your tin can idea this year. They also smell good, as I remember from loooong ago, right? Thank you, thank you. That is the perfect idea for the women in my book club. I have been racking my brain for something quick, easy and appreciated. I'm going to run downstairs and get my tin cans ready. Super idea, you must have know that I needed you :P.
I LOVE this idea. Went to Osh today to buy supplies and they were sold out of paperwhites. Headed over to my local garden store where owner Steve, the walking encyclopedia of all things green related, told me that paperwhites are becoming harder and harder to find. All stores around here are sold out(Los Angeles Area). Then he went on a tangent how the big maker went out of business a few years ago and all that's left is nothing to write home about and how canadian bulbs are 2nd rate garbage... : ) Alas, I won't be doing this project afterall!